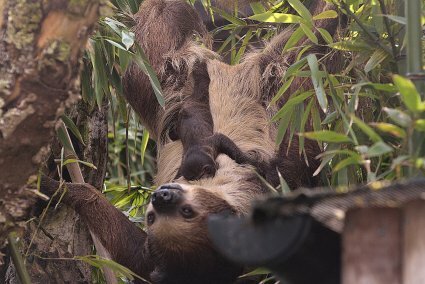 Drusillas Park, East Sussex is celebrating following the arrival of rare baby sloth – the first to be born at the award-winning zoo in its 91 year history. Sidone the Linne’s two-toed sloth gave birth on Saturday 26 March much to the delight of staff at the zoo. The happy discovery was made by self-professed sloth fanatic and Head Keeper, Mark Kenward during his early morning checks. What makes this rare arrival even more precious is the fact that first-time mum, Sidone was hand reared as a youngster. However, despite her own bumpy start she is proving to be an excellent mother.